SINGAPORE & NEW YORK, 19 OCTOBER 2018; This week sees Cakewalk by BandLab at the 145th International Pro Audio Convention run by the AES (Audio Engineering Society) in New York, with the team showcasing the latest updates including integrated élastique Pro time and pitch stretching as well as AudioSnap enhancements. 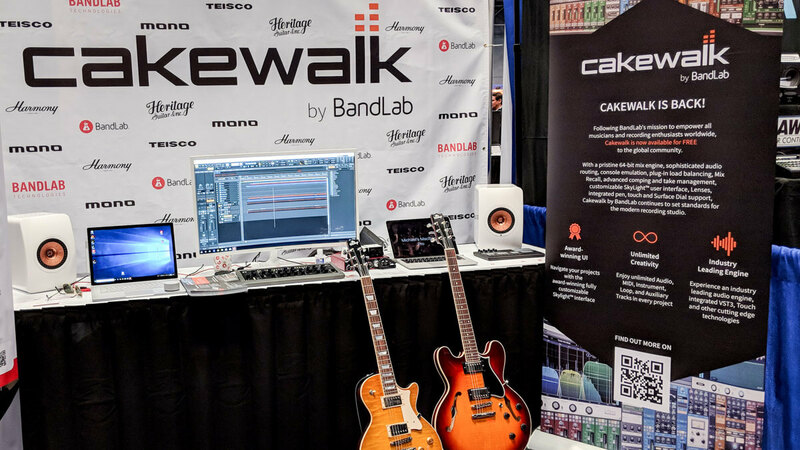 This is Cakewalk’s first official outing since BandLab Technologies acquired Cakewalk in February 2018 and subsequently released the legendary DAW for free to the global community. Under BandLab’s stewardship, Cakewalk has made astonishing advances in stability and speed in a very short time. The development team have made great use of the freedom allowed by the new freeware licensing model, where focus can shift from attracting more paying licensees to pure user experience. They have addressed long-deferred bugs and implemented long-requested ‘smaller’ features that together add up to a more robust, faster, friendlier DAW. Not only did BandLab “rescue” SONAR, they’ve improved it – stability, fixes and enhancements. Cakewalk has been my go to sequencer and DAW since 1993 it goes from strength to strength from owner to owner, the future is brighter now with BandLab than at any time in its history. I’ve been a recording artist and producer for much of the last 30 years and most of it has involved Cakewalk products in some way. In that time I’ve produced dozens of internationally released albums, film soundtracks, live concerts and more. Currently, Cakewalk by Bandlab is the centrepiece of my workflow, building and expanding on the legacy of past products. I truly believe this is a golden age of development for the product, not only with new features continually being added but with the agile response and forward thinking of the dev team keeping on top of any issues immediately, and making smart choices for the future. BIG thank you to all at BandLab for one of the smoothest moves ever. In less than 2 hours, all was downloaded, tweaked n twisted, working perfectly on my mobile recording laptop. Not in a million years would I have dreamed this would be the outcome for SONAR users. Hat’s off…BandLab just set a whole ‘nuther standard. For more information, visit http://cakewalk.bandlab.com. BandLab Technologies is a collective of global music brands with a vision to connect the world of music.Together, our brands share a passion. We’re driven by integrating the physical, digital and social supply chain, to enable better experiences, opportunities, and connections for all music lovers. Established in 2016, BandLab Technologies is headquartered in Singapore. Cakewalk is the leading developer of powerful and thoughtfully designed products for the modern musician. These products include award-winning digital audio workstations and innovative virtual instruments. Millions of musicians worldwide—including Grammy® and Emmy®-winning producers, composers, sound designers, and engineers—use Cakewalk products daily to produce audio for the professional music, film, broadcast, and video game industries.